OVER the last year I've written an unprecedented amount of posts about artistic improvement. Recently I've been reflecting on the idea that artists have to develop excess ability and then relax into an optimal yet comfortable working stride. One particularly memorable concept was the improvement cycle where an artist evolves through four stages finally arriving at conscious competence–having a realization of how you do what you do and doing it in a relaxed state. The alternative is thrashing your way forward clueless as to why things are working–or more likely–not working. As I was reflecting on the various observations about improvement I recalled a phenomenon I experienced in my development that I've never stumbled across in books on the subject–where I struggled to master a technique only to finally give up–only to discover a short time later I possessed the hoped-for skills. My first experience was in High School. I was struggling to draw with charcoal. All my charcoal attempts were dissatisfying. I finally gave up and pushed the supplies under my bed. A few months later I inadvertently tried charcoal again in art class and had an unexpected success–enjoying a proficiency I hadn't previously possessed. Later I tried my hand at the animation business doing layouts for The Incredible Hulk and The Amazing Spiderman TV shows. It involved drawing layouts in a unique method unfamiliar to me and not intuitive at all. I struggled through four seasons trying my best but never really knowing what I was doing. A sense of inadequacy persisted. Later, living in New York and illustrating a children's book, I realized I had absorbed the previously unmastered concepts and was drawing effortlessly from imagination. Later during that same era I began painting book covers in acrylic after a frustrating period trying to master acrylics. The tipping point this time was attending the World Fantasy Convention in Boston and viewing book covers by fellow illustrators. In that case seeing the art crystallized my thinking and allowed me to begin painting book covers at a professional level. In all three cases I cannot articulate the missing ingredient that, when embraced, allowed me to work at a higher level. All I can say is that I struggled and struggled–usually giving up in despair or disgust–only to discover later I had absorbed the necessary skills afterall. In the case of animation layout it seemed as if I would never learn the required skills and I had truly given up trying to master the art. It was over a year after abandoning the attempt that I discovered I had mastered the concepts. I have never mastered the art of plein air painting. I would say that I'm at the stage of conscious incompetence. With studio painting I'm somewhere between conscious incompetence and conscious competence (which is a great feeling–I feel more in control and the work shows it). I wish I could give more advice on how to shorten this process, or how to eliminate some of the pain. All I know is that there is a lot of mystery in the artistic process. We can describe some of it. But mostly we observe, and hope, and wait. 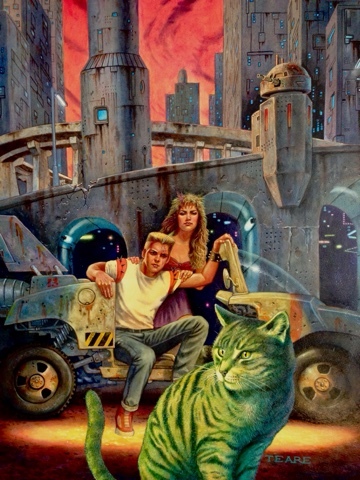 Book Cover for Green Millennium, acrylic 24" x 16"
Great post. Very interesting how sometimes time away somehow allows our brains to put together the puzzle. I feel part of this is that we've had time to reflect on the information we previously digested and somehow we've continued piecing that together unconsciously. It seems we never reach the vision in our heads and that is what keeps us working and growing. You are probably right, Brandt. What remains a mystery is the length of time between giving up and mastery. Technically if the 10,000 hour theory is true having a fallow period should put you behind. Needless to say, there are a lot of holes in a lot of theories about learning and creativity. Thanks for your comment.